Brave New World: What's That In Your Pocket Sir? So we have the introduction of wearable mobile devices; watches from Samsung and also Google Glass. Both providing ‘accessories to be seen wearing’, but which will probably date and be superseded very quickly. The Samsung watch is far from sleek and has as much design cache as those first ‘brick’ mobile phones. To make matters worse it doesn’t replace the mobile but ‘compliments it’. It’s as if the manufactures can’t decide how big our physical pockets are, or just how many gadgets we actually want to carry around with us. Will tomorrow’s commuter really be wearing Google’s Glass, have a Samsung watch on their wrist, carry a smartphone and have a tablet tucked away in their bag? They could be soon joined by other devices to track our health and dismisses the eink readers as an evolutionary step we have already taken.. The challenge is that they all have to have significant feature and functionality overlap and the common denominator is actually very high which make accessories either very specialist or prone to be pure fashion statements and subject to the swings and moods of the market. 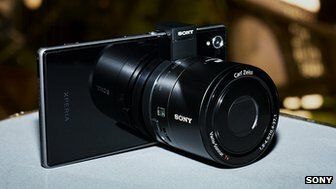 However, just when we thought we had seen it all up steps Sony with its supersized lenses which connect to smartphones by wi-fi, allowing them to take higher-quality photos. They are compatible with Android and iOS handsets and were announced alongside a new Sony smartphone which features a 20.7 megapixel camera and a larger-than-normal image sensor. The QX10 lens offers a 10x optical zoom and 18.2MP resolution which Sony says makes it ideal for taking shots of distant landmarks or close-ups of people. It will cost about £170. There would appear to be two flaws in Sony’s strategy. You either want to give more megapixels to the camera within the phone and compete head to head with the pack, or you step to the side and develop the accessory lens. To do both effectively creates two competing products, adds costs and confuses the consumer. We are living in a YouTube age where convenience out strips quality and ask how many video cameras you see today. For those wanting top-quality photographs, the experience of having a DSLR [digital single lens reflex] offers a better experience than a Sony add-on camera. Sony itself has even acknowledged that it did not know how strong demand would be. So what does this tell us about the developing market. It is clear that peripheral devices will evolve and that leads one to ask whether they will then shrink the smartphone to a network hub or compete with it as a standalone. It is like the laptop, tablet smartphone battles, we have to establish the optimum form factor and what differentiates one from another. This is very important for all content, media producers and services who want to be device agnostic.